Happy Halloween, everyone! I admit, I’m not much for Halloween, other than the kids enjoy dressing up. It was just never a big deal at our house – we tended to turn out the lights and hope no one came to our door, lol. Our church hosts a big Harvest Party carnival and Trunk or Treat, so we’ll be there all night. We baked brownies and made drop doughnuts for the cake walk – taste tests prove that I am actually a good cook. 😉 We’re decorating our car trunk as a shark – Hallie and her daddy have been working on that for a couple of days. I will get a pic of it when it’s in line with the other trunks. Interview update – thank you for all your prayers as we waited for my husband’s interview, and now we wait another 3 weeks to find out if he got the job. He feels like it went well, and he has some pieces of information he needs to get to them. He was told to assume he will get the job and work on finding those pieces of paper, because he wouldn’t be able to start the academy without them. BoInk – no pic this week, because all I managed was to finish the purple on that right motif. Last Sunday my mom returned from a business trip, so we had a long morning/afternoon. Her flight was delayed almost an hour. If I’d had BoInk with me at the airport, maybe I would have accomplished more. Advent calendar – I’ll start posting pics tomorrow (Nov 1). I’ve finished days 1 & 2 and made a good start on day 3 yesterday. I’ve got to pick up the pace, though, now! 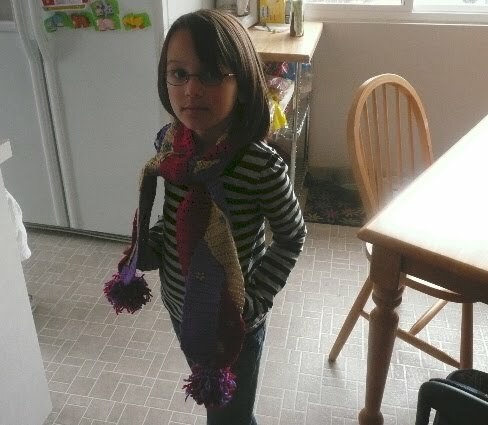 Hallie’s scarf is finished (again!)!!! I managed to re-plait it without cutting it apart, just by twisting until it was flat. I then used Stitch Witchery to tack the strips in place where they cross each other. And I discovered what happens when you steam acrylic yarn. I’ve never blocked my crochet pieces, because I’m fully aware that acrylic is basically plastic, and applying heat to plastic may not have a good result. In this case, the strips flattened out so they’re less bulky, and actually look more knit than crochet (this pic was taken after steaming the Stitch Witchery sections, but before I went back and steamed the rest of the scarf to even it out). I then used perle cotton to secure the strips to each other (because I don’t really trust glue on yarn) and covered the stitch with a pretty bead (thanks for the idea, Deb!) – Hallie picked out the flower beads at Joann, and picked the color placement (she’s modeling it at the top of this post). Very pretty! I love the scarf.